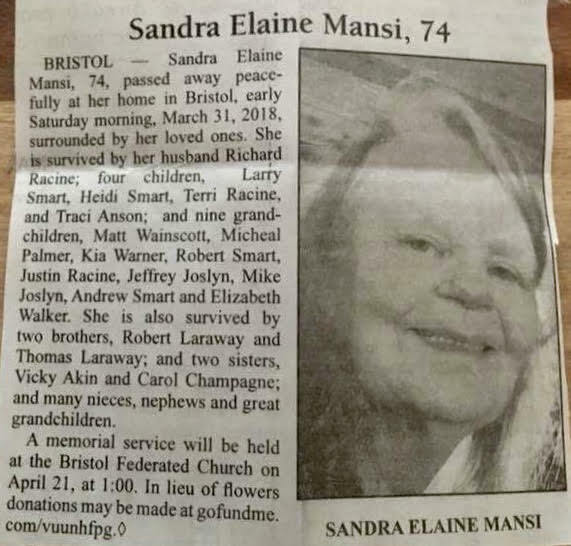 Early on the morning of Saturday, March 31, 2018, at Bristol, Vermont, Sandra Mansi, (born November 20, 1943), 74, passed away of cancer. 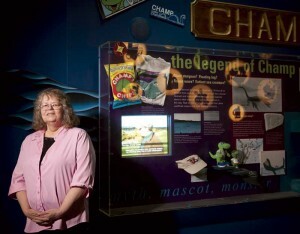 Mansi was especially well-known in cryptozoology as the photographer of one of the Lake Champlain Monsters (“Champ”). 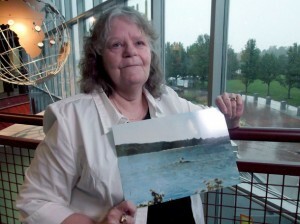 Her picture has been declared one of the best pieces of evidence for Lake Monsters. She was an icon in the field. She will be missed. On the warm summer day of July 5, 1977, Anthony and Sandra Mansi (who were engaged at the time) and her children were traveling by car from Vergennes to St. Albans, Vermont. They had spent the night with Sandra’s relatives near Vergennes, then drove along rural route 36, and stopped for a picnic at a lakeside field north of St. Albans. Fearful of the jokes and ridicule she might be subjected to outside her family, Mansi hid the picture for three years. Finally, encouraged by friends and the growing interest in Champ promoted by Zarzynski and his investigation, Mansi, by now living in Winchester, New Hampshire, produced the photograph for scrutiny by some academic types allegedly interested in the monster. The fact that Mansi had lost the negative, and had never known the exact location of the sighting, led to some difficult moments – until Mansi was introduced to Zarzynski. 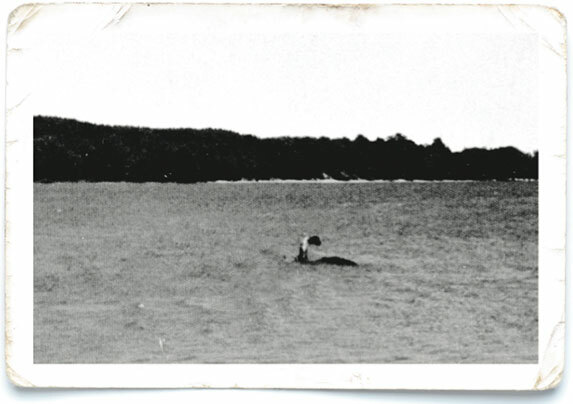 Finally, encouraged by friends and the growing interest in Champ promoted by Joseph Zarzynski, a New York social studies teacher who was investigating reports of the Lake Champlain Monsters, Mansi, by now living in Winchester, New Hampshire, produced the photograph and held it up for scrutiny by academic researchers interested in the monster. It was not a pleasant experience. Mansi suffered for months from nightmares, self-doubt and her fears of public ridicule. “It’s frightening,” she said, “and sometimes I wish I hadn’t told anyone about the picture, or I hadn’t seen the monster.” The fact that Mansi, following a divorce, relocations, and moves, had lost the negative by that time, and had never known the exact location of the sighting, led to some difficult moments, as her credibility was questioned. But the experts now uniformly hold the photograph in high regard. Zarzynski calls it “the single most impressive piece of evidence” for Champ. University of Chicago biologist Roy Mackal, along with cryptozoologist J. Richard Greenwell of the Office of Arid Land Studies and photo analyst B. Roy Frieden of the Optical Sciences Center, both of the University of Arizona, examined Mansi’s photograph and subjected it to computer analysis. Frieden, a professor of optical sciences, found no evidence of a montage or superposition. Greenwell and Mackal were similarly convinced that Mansi had snapped a picture of an unknown animate object in the lake. 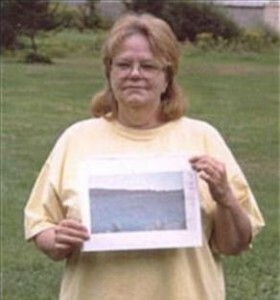 In 1999, the skeptical producers of the PBS program NOVA would run more analyses, and claim the Mansi photograph was one of the few pieces of good evidence for an unknown animal in any lake in the world. Sandra Mansi, soft-spoken and matter-of-fact, had become an instant celebrity thanks to the New York Times and Time magazine. 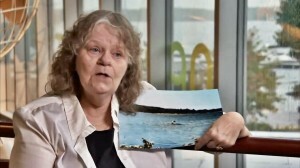 I spoke to her in late August of 1981, following a stimulating day at the first scientific seminar devoted to a study of the monster that has been reported lurking in the waters of Lake Champlain the past 300 years. Sandra Mansi moved on in her life, but the Monster in the picture turned out to be her legacy. Sure, there was family, work, and New England. But, alas, in the background, there always was Champ. And in her nightmares, the Monster. And her attempts to run away from something she never saw coming. Sandra Mansi and Joseph Zarzynski are at the extreme right. 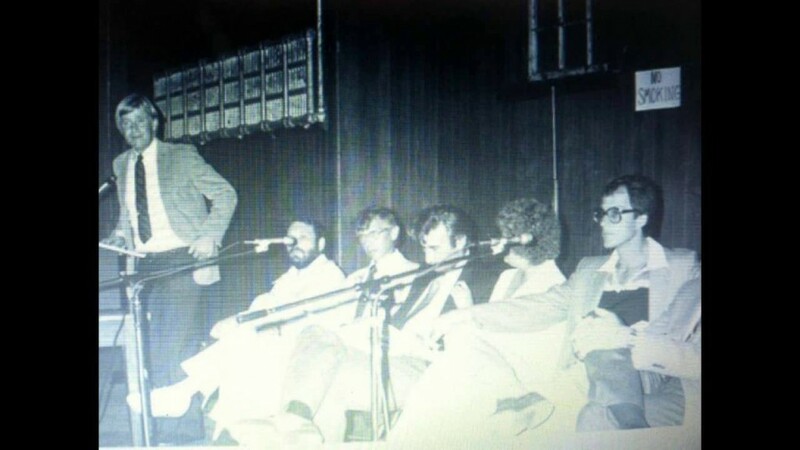 It was at the 1981 seminar, where I first met Sandra Mansi. 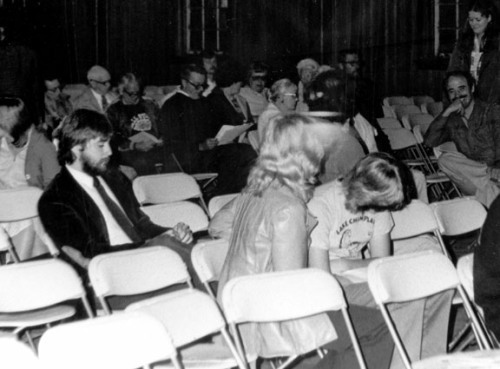 The “Does Champ Exist?” seminar took place on August 29, 1981, in Shelburne, Vermont. 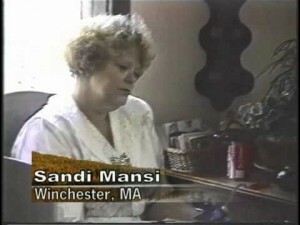 Interviews with Sandra Mansi can be found archived in collections of Monsterquest (2007), Weird U.S. (2004) and Weird Travels (2003).